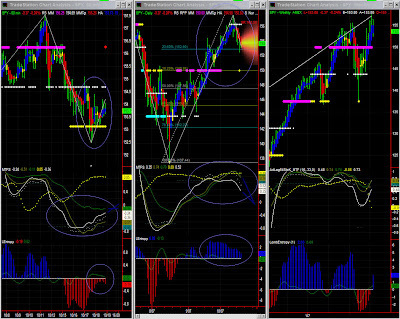 Dominant TF: Daily and 60mins Swings: UP-DN-UP Market direction: Congestion. Upward bias still valid overall despite some profit taking. 60mins: Congestion to mildly down. Erosion of SPY should continue. The 153.13 pivot level was tested, and will be tested again. Congestion or a shallow bounce on 153 is a likely scenario at first. Daily: Profit taking until support is found (150??) AdStoK is so overbought with a white line declining, bars turning red and Entropy losing steam: SPY can only go lower. This is however not indicative of any strong retracement in the near term, so profit taking should continue at a slow pace, possibly to the 150 MM + Fib level. Weekly: mildly UP, but caution: significance level is ridiculously low. The Swing indicator is up, but the key swing price level is still close at this time frame, so the indicator could turn around again. For the time being, everything points upward. We can however see some divergence in AdStoK and a very low significance level at this time frame (divergence? ), so this is at best only a background information at the moment, and one should certainly focus on lower time frames (60mins and daily). Here also is a commented audio soundtrack (8m25s) to complement this SPY chart. The purpose is to teach traders how simple it can be to read charts using this TradeStation technique. Please note that these indicators can be used unchanged on various symbols and time frames. The technique was designed to remain as simple as possible so that decision making remains quick and as unambiguous as possible. It must also be noted that all indicators feed an API allowing developers to build their own rule set to contribute to even easier decision making.